Soflens Daily Disposable is an easy to use contact lens from Bausch & Lomb. Soflens Daily Disposable lenses have been specifically designed to deliver clear vision in tough conditions where lighting may be poor. The lenses are worn for one day and replaced with a fresh pair the next day. Purevision Multi Focal is a silicone hydrogel based contact lens designed for replacement every month. These contact lenses provide all in one vision correction for people who cannot see clearly into the distance or focus effectively on closeby objects. Purevision Multi-Focal lenses can be worn whilst the wearer is awake or continuously whilst the wearer is awake and asleep. However, not all eyes are suited to continous wear of Purevision Multi-Focal lenses and only an Optician can determine the appropriate wearing schedule for a patient. Soflens 59 is a monthly contact lens that is worn during the day then taken out at night. The lens is 59% water (hence the name Soflens 59) and has been designed to allow oxygen to easily reach the eye. Keeping the eye well oxygenated gives the wearer a refreshed feeling in the eye. Soflens 59 contact lenses are typically replaced every month. Soflens Toric contact lenses deliver all of the benefits of monthly contact lenses to patients with astigmatism. They are designed for replacement either every two weeks or every month. Soflens Toric contact lenses are made with a deposit reistant material which maintains a refreshed feeling in the eye throughout the day. Soflens Multi Focal contact lenses offer clear vision to the wearer at all distances. The lens has been developed by Bausch & Lomb using a cutting edge technology called Natra Site which means different parts of the lens are used when the wearer is looking over different disrances. Soflens Multi Focals should be cleaned and stored every night and replaced after one month of use. This lens case is ideal for storing and carrying your contact lenses. Renu Multipurpose Solution is a contact lens solution that can be used for cleaning, disinfecting and storing soft and silicone hydrogel contact lenses. The Handy Pack comes in a 120ml bottle. Sensitive Eyes Plus is a popular saline solution which is recommended for rinsing daily disposable contact lenses. Please note that this product does not fit through most UK letterboxes so someone may have to be available to collect it. Renu Multipurpose Solution is a contact lens solution that can be used for cleaning, disinfecting and storing soft and silicone hydrogel contact lenses. This 60ml bottle flight pack is ideal for international travellers as there is currently a 100ml liquids limit for all flights out of the UK. ReNu Multi-Purpose contact lens solution is now available in this convenient 60ml pack. The 60ml bottle is ideal for carrying in handbags or on flights. 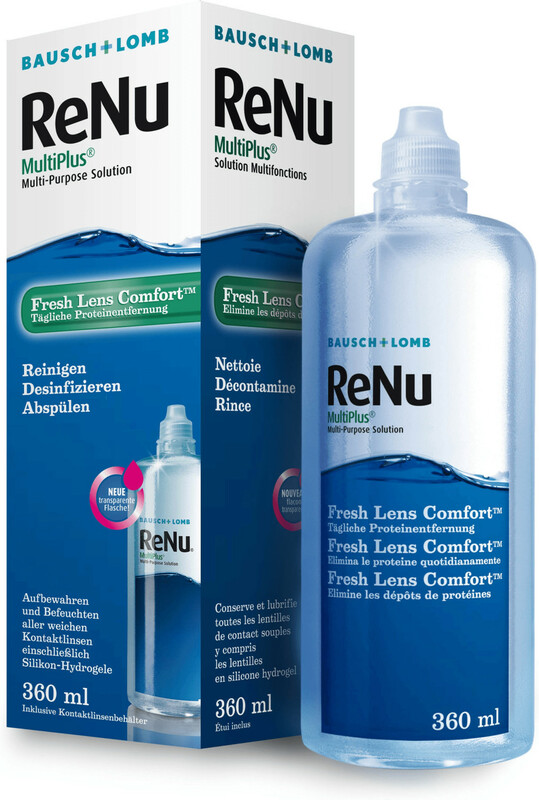 ReNu Multi-Purpose is a recommended solution for cleaning and storing two weekly and monhtly disposable contact lenses. Soflens Daily Disposable Toric for Astigmatism contact lenses are the new daily disposable toric contact lenses from Bausch & Lomb. For the first time, Bausch & Lomb have produced a contact lens for astigmatism that patients can change on a daily basis. Soflens Daily Disposable Toric contact lenses offer Bausch & Lombs Advanced Lo-Torque design, meaning minimal rotation. They therefore provide crisp and stable vision. This is combined with a non-ionic material that gives Soflens Daily Disposable Toric contact lens wearers a great sensation of all-day comfort. A moisture-rich soaking solution in the Soflens Daily Disposable Toric contact lenses provides exceptional comfort with every blink. As Soflens Daily Disposable contact lenses are designed to be used only once, wearers with astigmatism have the hygiene benefit of using a fresh pair of contact lenses every day. Soflens Natural Colors are monthly disposable coloured contact lenses that can enhance or change eye colour as well as correct vision. These lenses are available in nine shades, and unlike other coloured lenses, are suitable for dark eyed contact lens wearers. Soflens Natural Colors are manufactured by Bausch & Lomb to the same high standards as their other prescription lenses, offering a stylish alternative to regular monthly disposable lenses. Now you can choose the look you want easily. Biotrue is inspired by the biology of your eyes and is the only solution with the same pH and lubricant found naturally in your eyes. These natural ingredients create a solution that delivers unsurpassed cleaning and disinfection efficacy, thanks to their unique innovations, inspired by the biology of your eyes, combined with the dual-disinfection system. Biotrue also helps to keep certain beneficial tear proteins active, to maintain the health of your eyes and the comfort of wearing your contact lenses. This twin pack contains a two and half month supply of cleaning solution. Boston Cleaner is specifically formulated to provide hard and gas permeable contact lens wearers with a solution to effectively remove any protein and lipid deposits from their contact lenses. The unique ingredients contains within the solution effectively removes dirt and stubborn deposits from your lenses for clean, comfortable wear, whilst a special ingredient has been added to visibly tint the lens so you can see when your cleaner has been thoroughly rinsed off. PLEASE NOTE THIS PRODUCT IS FOR USE WITH HARD AND GAS PERMEABLE LENSES ONLY. The Boston Advance Conditioning Solution provides a complete conditioning cycle which works at wetting, soaking and disinfecting any hard or gas permeable contact lenses. The Boston Advance Comfort Formula Conditioning Solution helps to reduce any friction against both the cornea and eyelids whilst removing any particles matter that may cause the wearer irritation and discomfort. The special formula is designed to be biocompatible with your eyes and contains an optimised preservative system that works to effectively remove any harmful organisms on the surface of your hard or gas permeable lenses. This pack contains a months supply of solution. PLEASE NOTE THIS PRODUCT IS FOR USE WITH HARD AND GAS PERMEABLE LENSES ONLY. Boston Multi Action Simplus Solution is a specially formulated solution that cleans, disinfects, conditions, cushions, rinses, wets and removes protein from gas permeable lenses, all from one bottle. This makes Simplus an essential solution for busy wearers who need a convenient but effective solution for their daily cleaning requirements. With the built in protein remover, Simplus, makes the process of cleaning and maintaining your gas permeable lenses easy and convenient. Using Simplus also means no evening rub care regimen for even greater convenience, instead you can rub and rinse in the morning. This 120ml pack contains a months supply of cleaning solution. PLEASE NOTE THIS PRODUCT IS FOR USE WITH HARD AND GAS PERMEABLE LENSES ONLY. The Boston Simplus Flight Pack is a conveniently sized solution that can be used for the storing, disinfecting and cleaning of hard and gas permeable contact lenses. The single bottle lens care system not only cleans, disinfects and conditions gas permeable contact lenses, but also removes daily protein build up. This travel pack is perfect for use whilst on holiday or trips abroad and provides everything you need to care for your contact lenses on your journey. This pack contains enough solution for 2 weeks of lens care. PLEASE NOTE THIS PRODUCT IS FOR USE WITH HARD AND GAS PERMEABLE LENSES ONLY. 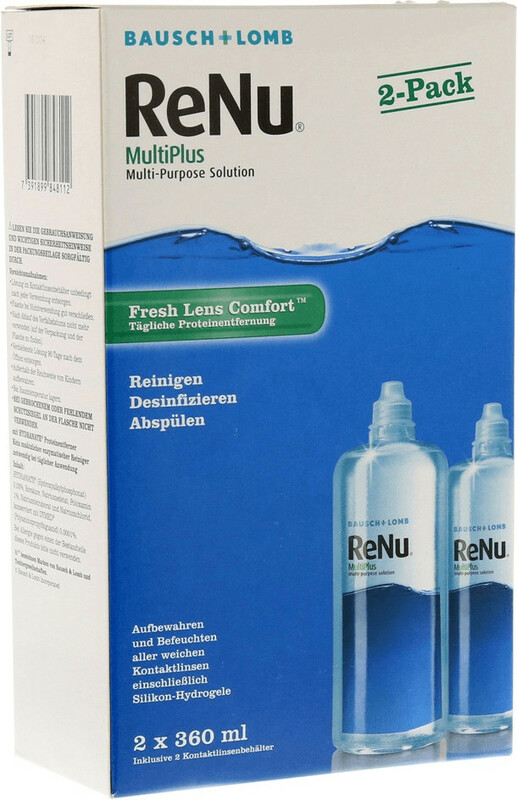 The ReNu MultiPlus Solution Starter kit is a conveniently sized solution that can be used for storing, rewetting and cleaning contact lenses. If you are looking to trial the ReNu MultiPlus Solution, this pack is the perfect starter option to see what this solution can do to make sure your lenses are maintained and cleaned effectively. The unique No Rub Formula conveniently cleans, loosens, and removes accumulations of film, protein, other deposits, and debris from soft contact lenses without the need to rub. This Starter Kit contains a weeks supply of cleaning solution. The ReNu MultiPlus Solution is perfect for storing, rewetting and cleaning soft contact lenses. The special ingredients in the ReNu MultiPlus Solution eliminate the need for a separate protein cleaner for many lens wearers, saving you time and money. The unique No Rub formula conveniently cleans, loosens, and removes accumulations of film, protein, other deposits, and debris from soft contact lenses without the need to rub. This pack contains a months solution for the daily cleaning and storing of lenses. The ReNu MultiPlus Solution Triple Pack is perfect for storing, rewetting and cleaning soft contact lenses. The solution is free from active ingredients to be sensitive to your eyes, whilst maintaining the effective moisturising and cleaning process. The unique No Rub formula conveniently cleans, loosens, and removes accumulations of film, protein, other deposits, and debris from soft contact lenses without the need to rub. This pack contains approximately 3 months solution for the daily cleaning and storing of your contact lenses. ReNu Multi-Purpose solution moisturises, cleans, rinses, stores, disinfects and removes protein for a complete eye care solution with any soft contact lens. The ReNu Multi-Purpose Solution contains a unique combination of ingredients to create a soft lens care product that caters for the everyday needs for the wearer to ensure the long lasting comfort of their contact lenses. The ReNu Multi-Purpose Solution is the one stop product to help clean, maintain and store your soft contact lenses. This Triple pack contains a 3 month supply of solution. The Bausch and Lomb PureVision 2 HD monthly lens offers a new level of vision quality thanks to their HD Optics, designed to reduce halos and glare, delivering the clear, crisp vision todays consumers expect from their contact lenses. The Purevision 2 HD lenses also offer outstanding comfort and breathability thanks to the thinner design and advanced Comfort Moist Technology. These combine to provide the wearer with outstanding comfort on insertion and help to support the comfort of the lens throughout the day. The thin lens design also allows high oxygen transmission to ensure your eyes stay brighter and healthier for longer. The Bausch and Lomb PureVision 2 HD monthly lens offers exceptional vision quality thanks to their HD Optics which is designed to reduce halos and glare, delivering the clear, crisp vision you should expect from your lenses. The Purevision 2 HD lenses also offer outstanding comfort and breathability thanks to the advanced Comfort Moist Technology, providing the wearer with outstanding comfort on insertion and supporting the comfort of the lens throughout the day. The thin lens design allows high oxygen transmission to ensure your eyes stay brighter and healthier for longer. Bausch & Lombs popular contact lens solution, Biotrue, is a multipurpose solution which can be used for both rinsing and disinfecting soft contact lenses. Biotrue has been designed to match the pH of healthy tears and to maintain moisture in the contact lens, providing the contact lens wearer with excellent comfort. Please note that someone may need to be available to receive the package, as orders containing Biotrue 300ml will not fit through most UK letterboxes. Purevision 2 HD for Astigmatism is the next generation of high quality, comfortable contact lenses in the Purevision family. The unique High Definition Optics provides the wearer with higher-vision quality in low light and helps to reduce the effects of halos and glare. The thin design of the Purevision 2 HD for Astigmatism lenses ensures your eyes can breath with high levels of oxygen able to pass through the lenses throughout the day, increasing the comfort and feel for the wearer. Purchase the Purevision 2 HD for Astigmatism contact lenses if you wish to see the world in high definition. The Biotrue Flight Pack is a conveniently sized multipurpose solution that can be used to store, rewet, rinse and clean your contact lenses. Biotrues unique formula contains a lubricant found naturally in your eyes, matching the pH of healthy tears to ensure your eyes and contact lenses stay comfortable for longer. This travel pack is perfect for use whilst on holiday or trips abroad and provides everything you need to care for your contact lenses on your journey. This pack contains enough solution for 2 weeks of lens care. Purevision 2 HD for Astigmatism is Bausch & Lombs newest addition to the Purevision family. Now you can receive all the benefits of Purevision 2 HD in a contact lens tailored for astigmatic eyes. Thanks to their thin design, these contact lenses are extremely comfortable to wear, and ideal at providing your eyes with the high levels of oxygen they need to stay healthy and fresh. Reducing the effects of halos and glare, the High Definition Optics makes sure you enjoy outstandingly clear vision at all times, even in low light. This pack contains 3 contact lenses. Order Purevision 2 HD for Astigmatism today, and discover what it feels like to see the world in high definition. This pack contains 3 contact lenses. Order Purevision 2 HD for Astigmatism today, and discover what it feels like to see the world in high definition. Bausch & Lombs Biotrue ONEday daily disposable lenses combine innovative technology with the best features of traditional contact lenses, to provide you with a superior wearing experience. Made from a bio-inspired material called HyperGel, these lenses replicate the natural water content of your eyes, retaining moisture and shape throughout the day. In addition, the state-of-the-art High Definition Optics technology helps shield your eyes from halos and glare, so you can see clearly in low light and bright sunshine. Order your Biotrue ONEday lenses online from Lenstore to enjoy clear, crisp vision, and ensure that your eyes stay healthy all day long. With our fast dispatch times and premium customer service, ordering your lenses has never been easier. Biotrue ONEday are daily disposable contact lenses manufactured by Bausch & Lomb. These lenses are made from HyperGel, which aims to replicate the natural water content of your eyes, maximising moisture and comfort. Perfect for people who lead busy lifestyles, Biotrue ONEday contact lenses feature the state-of-the-art High Definition Optics technology, which shields your eyes from halos and glares, and enhances your wearing experience in all lighting conditions. Buy your Biotrue ONEday contact lenses from Lenstore and enjoy competitive prices on top quality contact lenses, sourced directly from a UK manufacturer. Purevision2 HD For Presbyopia are the latest addition to Bausch & Lombs popular range of contact lenses. Designed to provide clear, high definition vision at all distances, these lenses are perfect for those who suffer from presbyopia, and look for an alternative to their bifocals or reading glasses. Purevision2 HD For Presbyopia contact lenses are made from silicone hydrogel: a material which enhances oxygen transmission, ensuring long-lasting hydration to your eyes. In addition, these multifocal lenses feature the cutting-edge 3-Zone Progressive Design, which enables your eyes to achieve optimal focus at any distance. Buy your Purevision2 HD For Presbyopia contact lenses online from Lenstore. We ship the majority of our orders on the same day, so you can sit back, relax, and wait for your lenses to arrive right to your door. Purevision2 HD For Presbyopia are the latest multifocal contact lenses in Bausch & Lombs Purevision2 range. Designed with state-of-the-art technology, they offer crisp, clear vision and a superior wearing experience. Thanks to the innovative 3-Zone Progressive Design, these lenses allow your eyes to focus effortlessly at all distances, providing a valid alternative to bifocals or reading glasses. They are also one of the few multifocal lenses available made from silicone hydrogel: a material that allows up to three times more oxygen to the eye than traditional soft contact lenses. Buy your Purevision2 HD For Presbyopia lenses online from Lenstore, and see why we are the preferred supplier for thousands of contact lens-wearers around the world. Biotrue ONEday for Presbyopia contact lenses combine an innovative bio-inspired system and 3-Zone progressive design, ensuring comfort and clarity for all distances, all day long. The bio-inspired HyperGel material is designed to provide your eyes with as much oxygen as the open eye needs to maintain healthy, white eyes, keeping your vision clear and fresh until the end of the day. In addition, Biotrue ONEday features the same water content as the cornea, ensuring your eyes retain moisture. As well as providing optimal comfort, these lenses cater for those with presbyopia, with an advanced multifocal design providing clear vision at all distances. With over 21,000 customers voting Lenstore the best contact lenses retailer in the UK, order your Biotrue ONEday today and enjoy VIP service and low prices. All Lenstore customers can now enjoy a complimentary eye test and other exclusive offers at their local Vision Express store, at no extra charge. Biotrue daily eyelid wipes gently clear away debris and impurities. This product is recommended for eye infections, ocular allergies and blepharitis. Free from preservatives, these wipes are ideal for sensitive eyes in both adults and babies. Soothing the affected area, this product does not disrupt the tear film. These wipes are all individually wrapped and for single use only. This ensures maximum hygiene for healthy vision. Buy your Biotrue daily eyelid wipes from Lenstore for super fast delivery. Over 90% of our UK orders are dispatched on the same day, so you wont have to worry about being without the products you need.